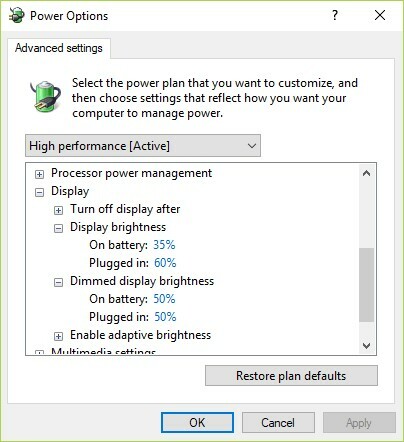 Some users complain that after a installing or updating Windows 10 build screen brightness control is not working on some laptops. When user tries to increase or decrease the brightness with the keys Fn+F11/ F12/ etc. (depending on the laptop model), nothing happens. All other combinations and functional keys work well. 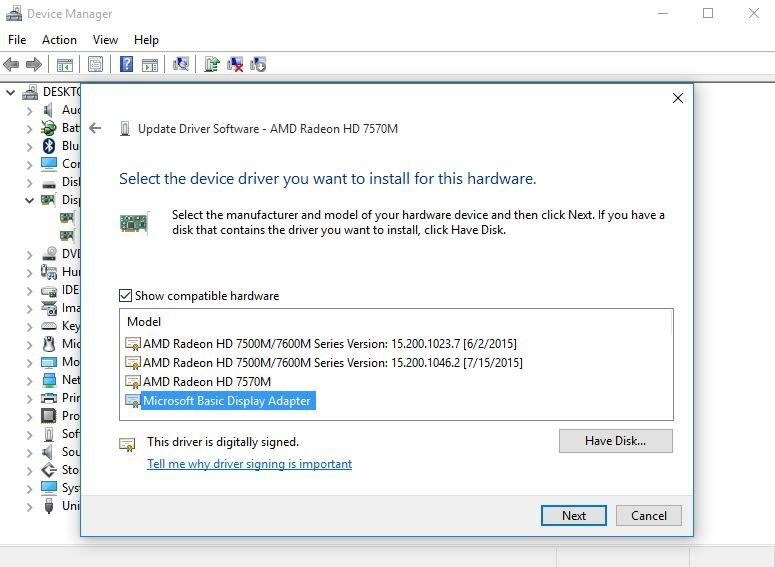 In most cases, the problem with adjusting the brightness in Windows 10 is related to the display or video card drivers (most often the problem occurs on devices with Intel Graphics and AMD Radeon graphics cards). However, there are other reasons. Consider a few simple ways to fix a problem when you can’t adjust the brightness on a Windows laptop. 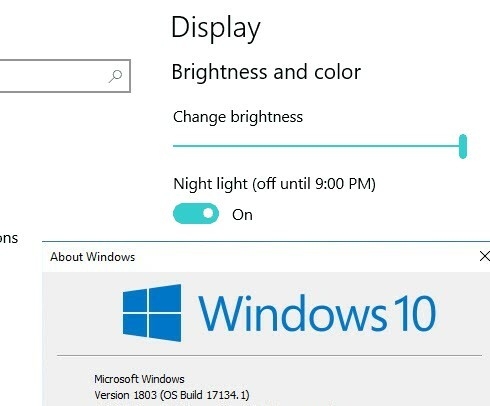 Some users are faced with the fact that after updating to the latest Windows 10 build (1803 April Update) they can’t change the screen brightness on many laptop models. Brightness control doesn’t work and is stuck at max level at any position of the brightness slider in the settings. Also it is impossible to change the brightness using the keyboard’s function keys. Almost in 100% of cases, the rollback to the previous Windows 10 build (1709) helps to solve the problem with the display brightness. There are simpler solutions for Windows 10 1803. Check the brightness settings in the: Control Panel -> Power Options -> in the properties of the selected power plan, click the Change advanced power settings -> Change advanced power settings -> expand Display. In the Enable adaptive brightness item, you must disable the adaptive brightness for the modes “On battery” and “Plugged in”. Tip. On laptops with an ambient light sensor (available on almost all modern tablets and laptops), adaptive brightness automatically adjusts the brightness of the screen depending on ambient light. If this function is enabled – you can’t significantly increase the screen brightness. If you can’t change the display brightness in the notification panel and in the screen settings, check whether the Generic Pnp Monitor is not disabled in your devices. This is the most common problem on Lenovo and HP Pavilion laptops. Open Device Manager (devmgmt.msc) and in the Monitors section check if the Generic Pnp Monitor is enabled. If it is not, right-click and enable it. Restart your computer and try to adjust the screen brightness. Perhaps the problem with the brightness is related to the current graphics card driver. 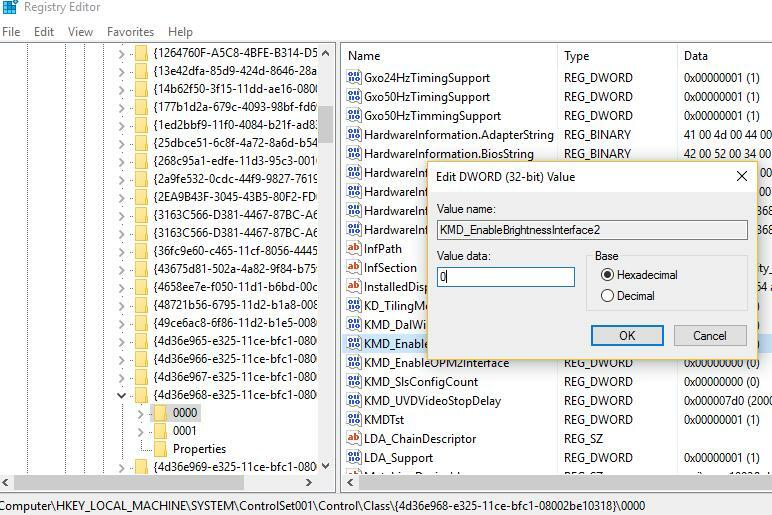 First check if your display adapter is enabled in the device manager (similar to the method above). If the previous method didn’t help, try to update your graphic card driver automatically (if the automatic driver update is not disabled). In the Device Manager (the same devmgmt.msc console) expand the Display adapters section and find your graphic card. Right-click it and select Update Driver Software. Then select Search automatically for updated driver software and wait till Windows 10 finds and installs the latest driver version (of course, your computer has to be connected to the Internet). If the automatic driver update didn’t fix the problem, try removing the current driver and installing the latest driver version from the manufacturer’s website. Find the DWORD parameter KMD_EnableBrightnessInterface2 and change its value from 1 to 0. Since there can be several KMD_EnableBrightnessInterface2 parameters in the registry, open the Find window (F3) and find all other parameters with the name KMD_EnableBrightnessInterface. Change the values of all found keys from 1 to 0. The last thing you can try, if other methods didn’t help, is to use the standard graphic card driver – Microsoft Basic Display Adapter. 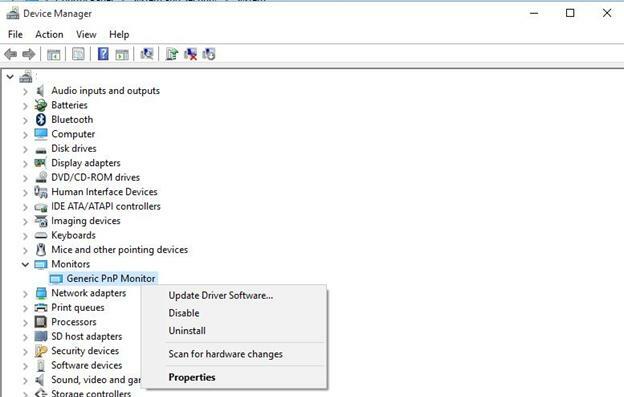 In the Device Manager select your graphic card, right-click and select Update Driver Software in the context menu. Select Browse my computer for driver software -> Let me pick from a list of drivers on my computer. In the list of drivers, select Microsoft Basic Display Adapter and click Next. The system will replace the current driver. Restart your computer and make sure that the screen brightness can be adjusted with the Fn keys. Some users have faced that the brightness adjustment in Windows 10 doesn’t work after installing the TeamViewer (remote management program). The fact is that TeamViewer adds its own Pnp-Montor Standard display driver to the system, which is used to compress graphics and optimize traffic. 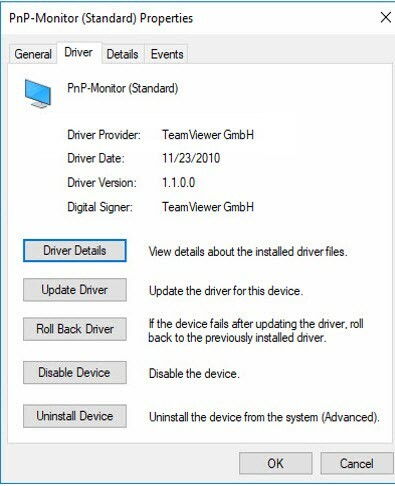 Try to replace the driver for this device to “Generic Pnp Monitor” (Right Click -> Update Drivers -> and select the “Generic Pnp Monitor” from the list of already installed drivers). If you found that adjusting the brightness in Windows 10 settings works fine, but the function keys (Fn) of brightness control on the laptop keyboard doesn’t work, most likely you need to install additional software from the laptop manufacturer. Change the value of the parameter FeatureTestControl from f000 to f008. 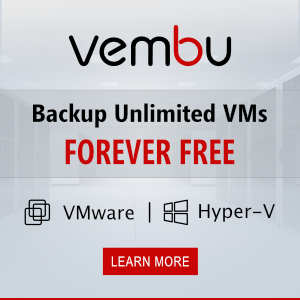 I have tried all of these solutions and it STILL does not work. Thank you SO MUCH! The TeamViewer thing solved the problem for me! I went crazy the past days and I think I will have to hugely apologize to my display adapter wo got reinstalled a very lot of times, recently. Pfew! Thanks a lot for that hint! You are welcome :). It was also a surprise for me that the TeamViewer causes problems with brightness control in Win10. Wonderful, thank you SO MUCH! The “Generic monitor” switch helped bring back the screen brightness adjustment! You’re a lifesaver! 🙂 Very professional post!